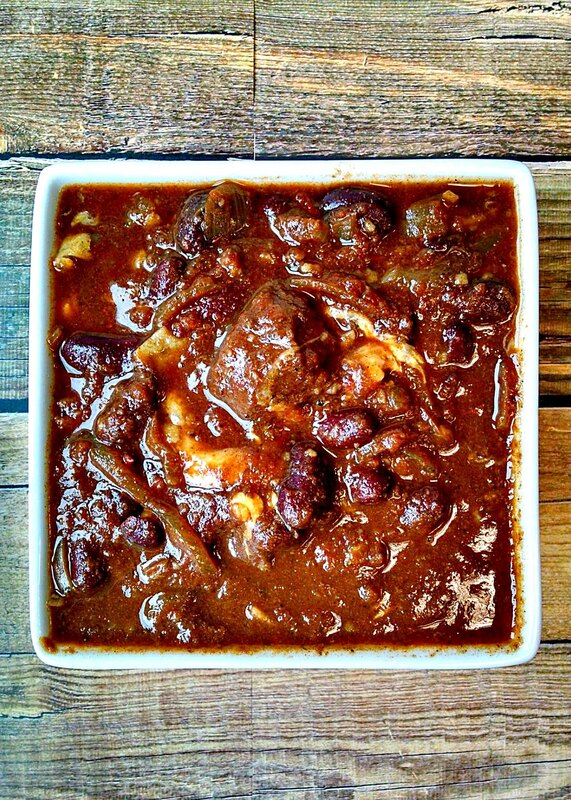 With Cincinnati style flavors, this Slow Cooker Cincinnati-Style Steak Chili is going to be your newest favorite slow cooker meal and favorite chili all in one! I had a hankering for some chili. Especially after winning this beautiful, new slow cooker from Hamilton Beach and The Weekend Gourmet. I mean, how pretty does that look? It’s so shiny!! So, of course I had to whip up something extra special and tasty in this new slow cooker. And, well, I had a hankering for some chili. You see, we had this chili cook-off at work. I was part of the group that organized it and I actually MC’d the event. Imagine that! Hermit! IN PUBLIC!! Go figure! So, after tasting about 8 different types of chili, vegetarian and meat versions, I had a hankering for chili. Yes, I keep saying that work because it’s truly the only word that really does describe this type of craving. Plus, it reminds me of those weekend cartoons about cheese. You know the ones. That came out around the same time as School House Rock? Time for Timer? No? Well, just get a load of this vid here and maybe it will jog your memory. If you’re around my age that is. I’ll wait. Catchy tune isn’t it? Sorry. Yes it WILL be stuck in your head. I apologize in advance for that. But just sharing the wealth if useless information that IS my brain! You are MOST welcome for that! So, that is why I’m saying hankering…repeatedly. 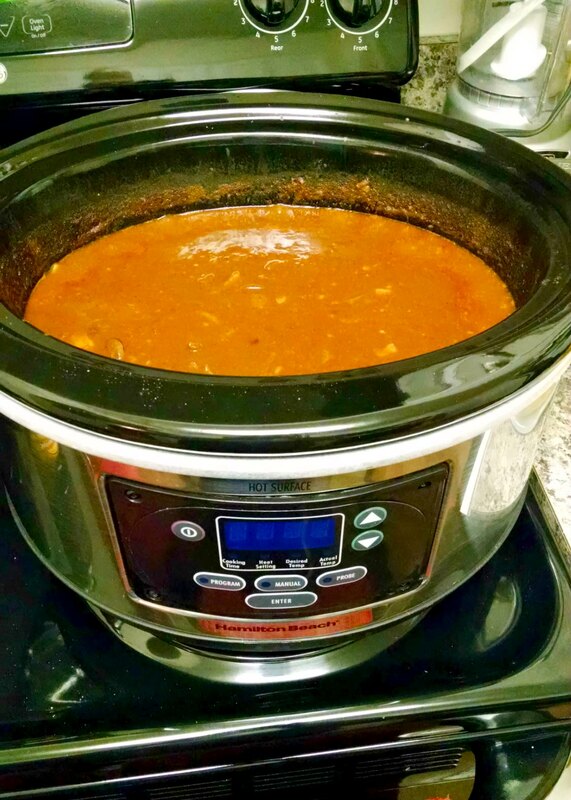 This new slow cooker screamed “make chili” at me and so I did. I took some ideas from the chili cook-off we had at work and threw them together in this delicious and hearty, perfect for game day, chili. There’s onions and tender chunks of beef slow cooked with crushed tomatoes and beef broth. All of which is flavored with chili powder, cumin, cinnamon, and some semi-sweet chocolate. Oh and there’s a hint of sugar in there to tie those sweet flavors to the savory. So, a word about the corn tortillas. They’re the thickening agent in this chili. Honestly. It’s not the first time I’ve used, but I think it’s the first time I’ve published this little trick. No, it’s not mine. 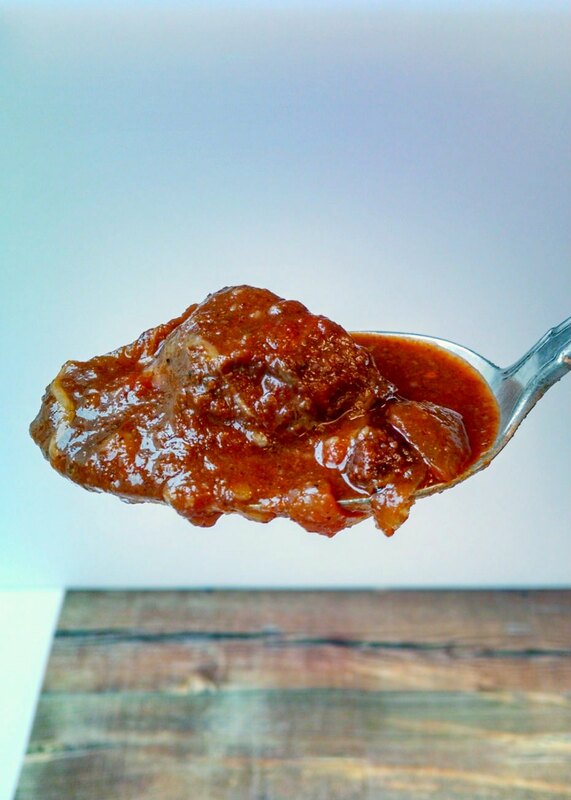 But, it is kind of handy and does a perfect job of thickening this hearty chili up in no time. Yeah. I’m a little excited about this dish. That’s an understatement. It honestly was so so SO tasty. I loved all the flavors and textures that this slow cooker chili brought to the table. 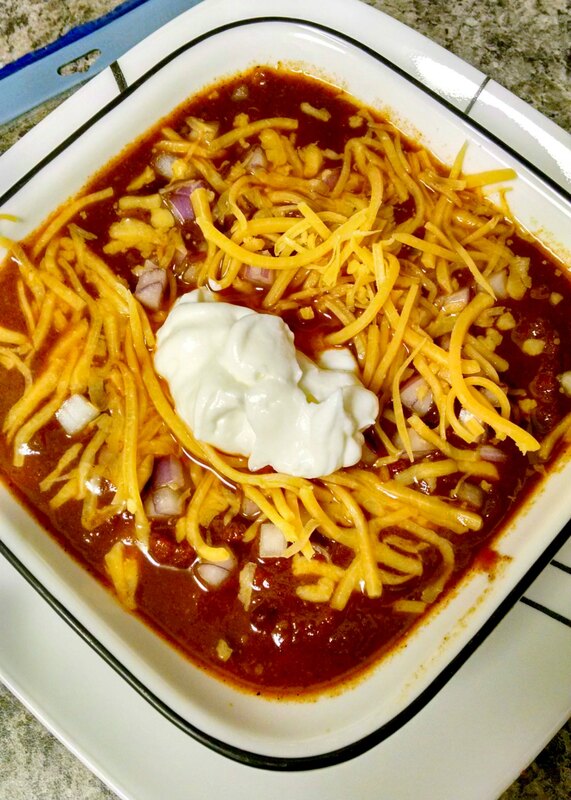 What’s your favorite style of chili? 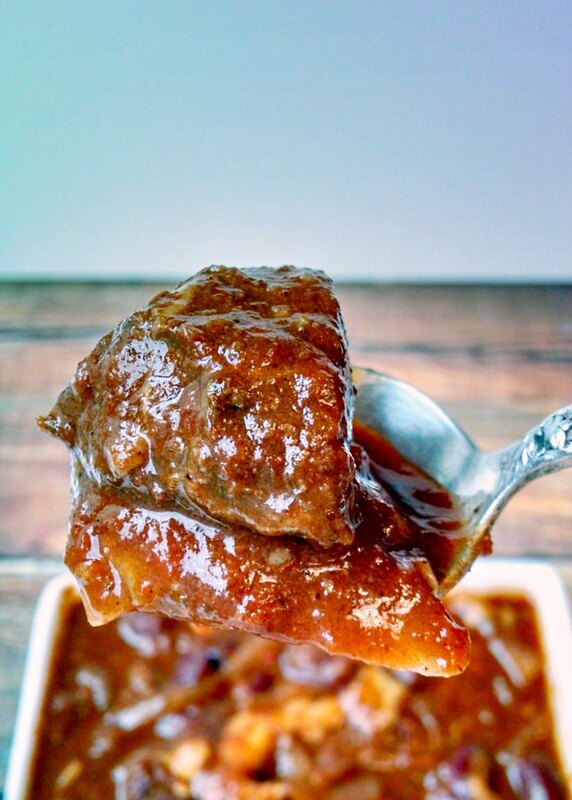 Place beef and onions in the liner of a slow cooker coated with cooking spray. Combine next 10 ingredients (crushed tomatoes through chocolate chips) in a mixing bowl. Pour over the beef mixture and cook on low 8 to 10 hours or until the beef is very tender. 30 minutes before serving, turn the slow cooker to high and add the corn tortillas. Simmer 30 to 40 minutes, stirring occasionally, until the tortillas dissolve and thicken the chili. Serve with cheddar cheese, diced red or green onions, and sour cream (optional). I now live in OH and haven't tried Cincinatti chili yet. But it's on the todo list. I didn't know about the chips as a thickener—wow. I like it. VERY nice selection of spices. The chocolate chips were inspired. Maybe that's standard in Cincinnati chili. But it's what give mole' the yum factor. Congrats on winning a new slow cooker!